The Perfect Stop For Any Customer On-The-Go! Truckers looking to fuel up, fill up, and get going can have the perfect stop at Clearwater Travel Plaza. Our friendly staff will help you get just what you need and send you off with a smile. 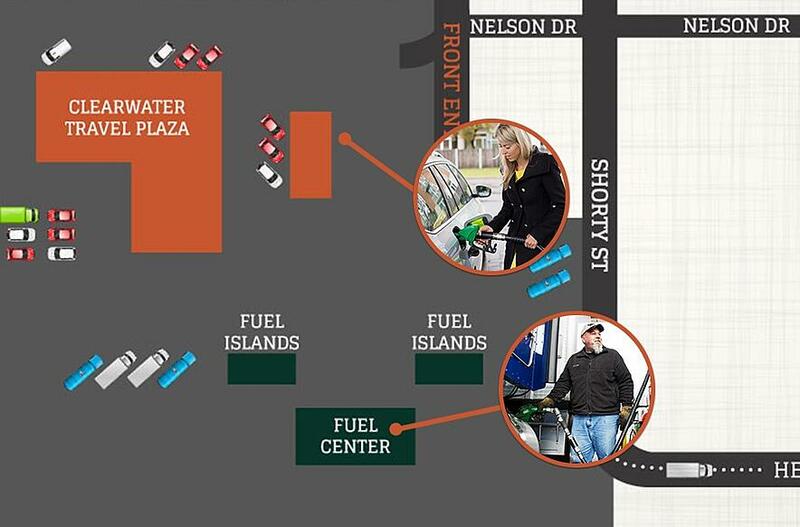 It’s easy to avoid any and all 4-wheeled traffic by fueling up at our fuel center. Not only will you be able to get in and get out easily, you’ll also have access to those basic necessities on your stop. Sometimes all you need is a quick bite, leg stretch, and bathroom break during your fuel stop. If you need a little something extra, you’re a couple trailer-lengths away from our General Store and other Professional Driver amenities. Homemade hot food options – including breakfast scramblers made while you fuel! Redeem Petro Points for food or merchandise. You will find whatever you are looking for in the General Store, including last minute groceries, a unique selection of gourmet candies, best-selling books and magazines, a variety of children’s toys and games, and much more! We proudly offer Holiday gasoline and diesel in all grades to fill your tank, including non-oxygenated premium gas for your recreational toys. After filling your vehicle, remember to give your car a little attention. We have a wide selection of oil, automotive supplements, wiper blades, and cleaning supplies. Don’t forget to check your window wash when you stop. Do you want your vehicle to look great when you reach your destination? The General Store also offers three choices of car washes. Select from: Classic, Platinum or Diamond washes. Receive a $2 Classic car wash with the purchase of 8 gallons of gas. Merchandise rewards card - select from free merchandise after 100 gallons.